Intralogistics means the process of optimizing, integrating, automating, and managing all of the logistical physical flows of supply, production and distribution within a distribution or fulfilment center. By optimising the integration of information processing with the latest material handling technologies and software achieves optimal productivity for both manual and automated systems. It is not just material handling technologies doing specific tasks like receiving, sorting, picking, and packaging, it’s much more than that. Intralogistics solutions make effective use of sophisticated database and warehouse execution software, which is constantly analysing and optimising the performance of operations. By regulating the system performance at all times ensures that processes are efficient at all times. With an intralogistic system equipment and labor resources are optimised at all times improving complete overall operational productivity. Intralogistics is an art or philosophy with a top down approach. First starting with an audit and discovery, data, and only then applying the appropriate equipment and software. Smart intralogistic processes can reduce a lot of waste within the process itself. We provide more than an automated material handling systems. 2HSSL always consider intralogisitcs. 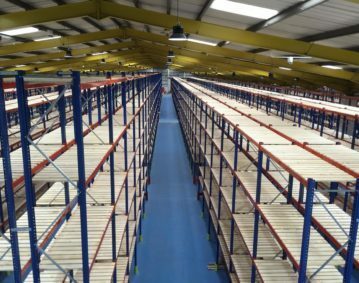 Being intralogistics experts, we have implemented solutions in a number of industry sectors from SME to larger distribution centres. We are aware of the strengths of brands and suppliers and depending on the project requirements appoint accordingly. We offer committed project management and personal support which is the foundation of the success of our logistics projects. Contact 2HSSL if you wish to implement intralogistics in your distribution or fulfilment centre.